Summer’s nearly swept me off my feet this year. We’re living in a third floor apartment in Newport, RI (gorgeous place, by the way) and my petite kitchen tucked into the eaves is just a perfect oven in and of itself. Needless to say, the prospect of turning on more heat in the kitchen is tantamount to self masochism and so I’m limiting that…greatly. So, rather than spending my time in my sweat lodge of a kitchen, I’ve been “cooking” mostly raw foods. 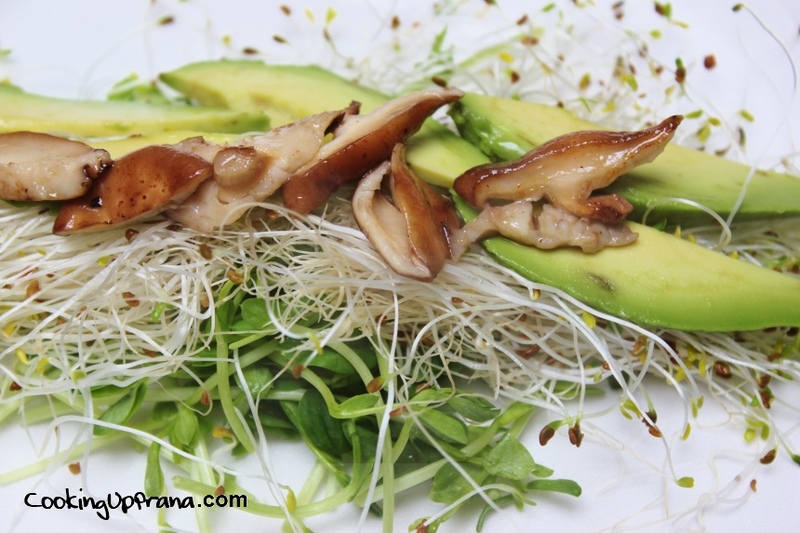 This, by the way is great for ALL doshas (vata, pitta, and kapha) – during the summer even vata’s digestive fire can handle the raw foods, green drinks n’ all. This recipe will cool you down and keep your taste buds happily dancing. 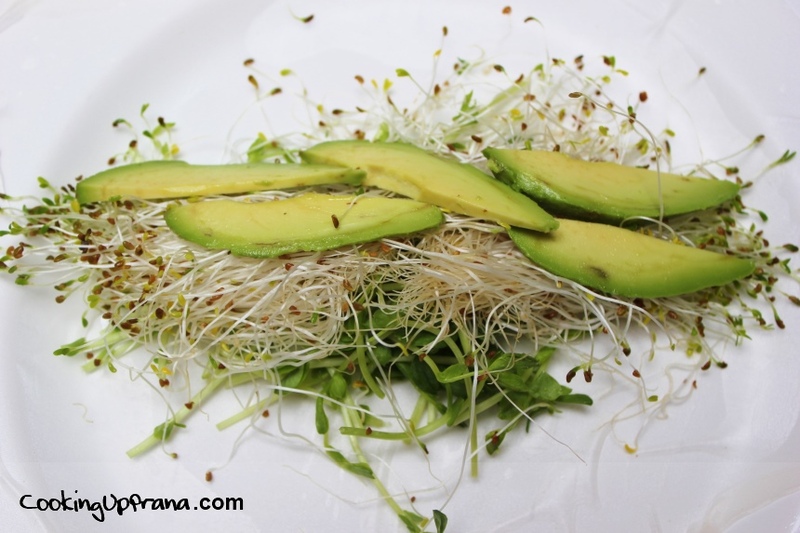 I’ve chosen to go with two types of sprouts – alfalfa and sweet pea – to form the green base of the roll. Other good sprout options are broccoli, sunflower, or the common bean sprout. For the “meat” of the roll I went with steamed, thinly sliced sweet potato (great for taste and color), perfectly ripened avocado, and lightly sauteed shitake mushroom. Mind you, the cooking part took under 5 minutes – thank God. This all gets wrapped up in a rice sheet and drizzled with my home-style vegan version of Green Goddess Dressing. Then, it’s pure heaven. In under 10 minutes lunch is ready, I’m not sweating, and cool as a cucumber I sit to gaze out my kitchen window to the fire escape herb garden to enjoy this luscious treat. Start by steaming the sweet potato - when thinly sliced this should take 5-8 minutes. 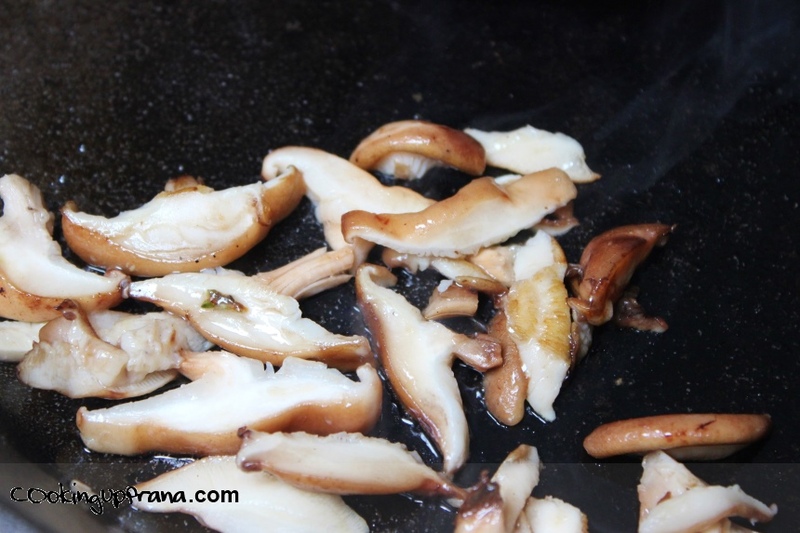 Meanwhile, add the coconut oil to saute pan at medium heat, once melted add mushroom slices. Saute till browned (2-3 minutes), set aside. Rehydrate the rice paper wrappers one at a time by soaking them in a plate filled with warm water - should take about 30 seconds per sheet. 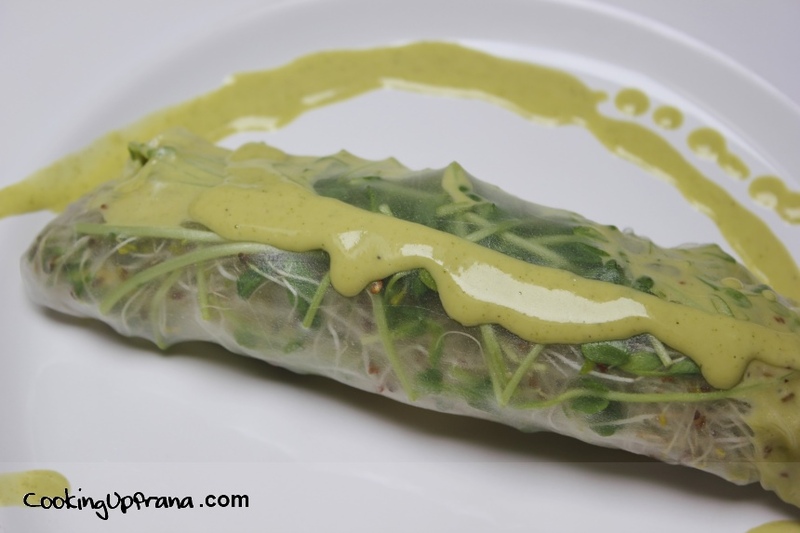 Take the rehydrated rice sheet and place it on another plate. Add the sprouts, avocado, mushrooms, and sweet potato. Wrap it up by folding the sides in first. 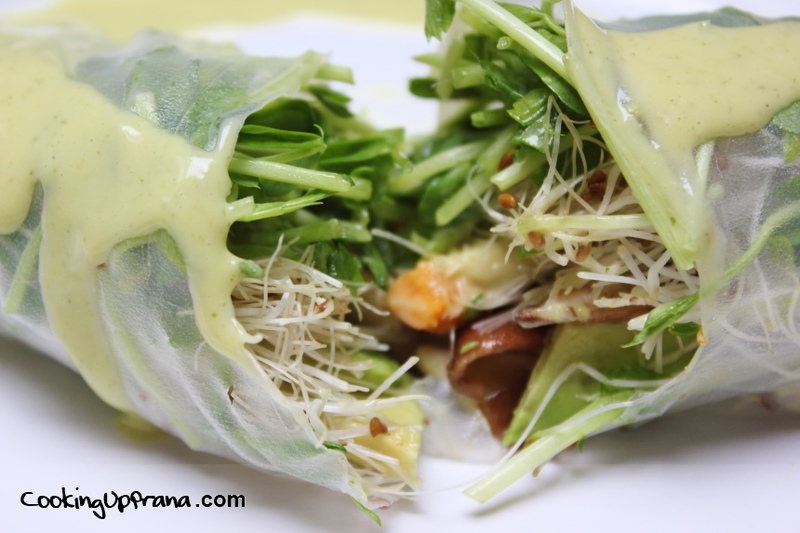 Drizzle the Green Goddess Dressing on top - I put it inside the wrap too! Use a blender to blend all ingredients thoroughly until smooth. NEXT POST: What is Ayurveda?